The vacuum-infused hull and deck are cored with discontinuous end-grain balsa set in polyester resin. Solid laminate is interposed around the keel root. The hull’s exterior is finished in isophtalic NG gelcoat and the bottom is barrier-coated to thwart osmotic blistering. High-load deck hardware installations are set over plywood coring. 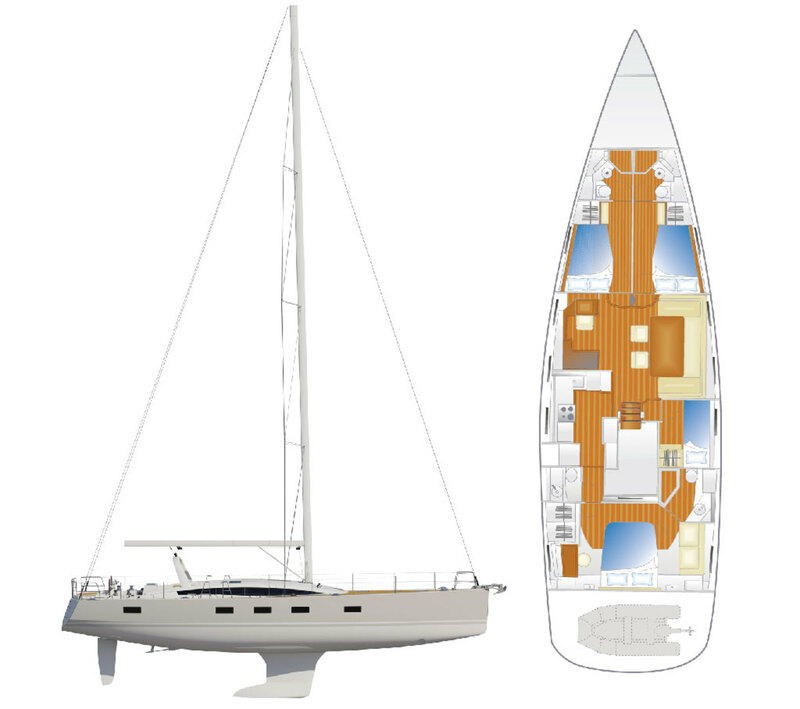 The hull’s structural grid is bonded in place, with laminate tabs in high-load areas. The structural bulkheads are vacuum-infused and are tabbed into both the deck and hull grid. The saloon sub-floor is framed in aluminum. Both keel options—a deep L-shaped keel or a shoal wing keel—feature cast iron encapsulated in epoxy. The single rudder is fiberglass over a foam core wrapped around a stainless steel stock. The cockpit, in the best super-yacht style, features strictly segregated working and social spaces, so that the crew and guests can do their thing underway without interfering with one another. Most of the area is taken up by a fantastic power-lounging pit with a pair of very comfortable high-backed bench seats ranged around two cockpit tables on electrically controlled collapsible pedestals. The tables can be set at lounging height or dining height, or they can lowered completely to form large sun-lounges or double cockpit berths. The working cockpit is aft, with a battery of Harken Rewind winches, Harken deck organizers and Spinlock clutches surrounding twin helm stations equipped with a full suite of Raymarine electronics. A cockpit arch forward carries a bridle for the mainsheet, which on our test boat was controlled with an optional belowdeck Harken electric captive-reel winch, another very nice superyacht touch. Betwixt the social and working spaces our boat also boasted an optional small wet-bar sink and a drinks fridge. There was even a clever collapsible barbecue that stowed under the starboard side helm seat. Yet another great superyacht deck feature is the tender garage behind the big fold-down transom. This includes an articulating rail system with an electric reel winch that allows you to effortlessly launch and retrieve heavy RIB tenders and other water toys. The forward bulkhead and floor of the garage are an integral part of the molded deck, so the yacht’s interior is always secure. Jeanneau, unlike a true superyacht builder, does not allow you to specify custom interior features on the 64, but the accommodation options are so malleable you will still very likely be able to find a combination that suits you. The only fixed portions of the layout are the galley, to port alongside the companionway, and the saloon dinette, set to starboard. All other parts of the interior—six in total—have two or more optional modules to choose from, creating a broad palette of possibilities. In terms of major staterooms, you can opt for a luxurious full-width owner’s space right aft or forward, complemented by two other staterooms in the boat’s opposite end, all with ensuite heads and separate showers. To port, aft of the galley, there is a small cabin that can be configured as a combination pantry and workshop or a day head. 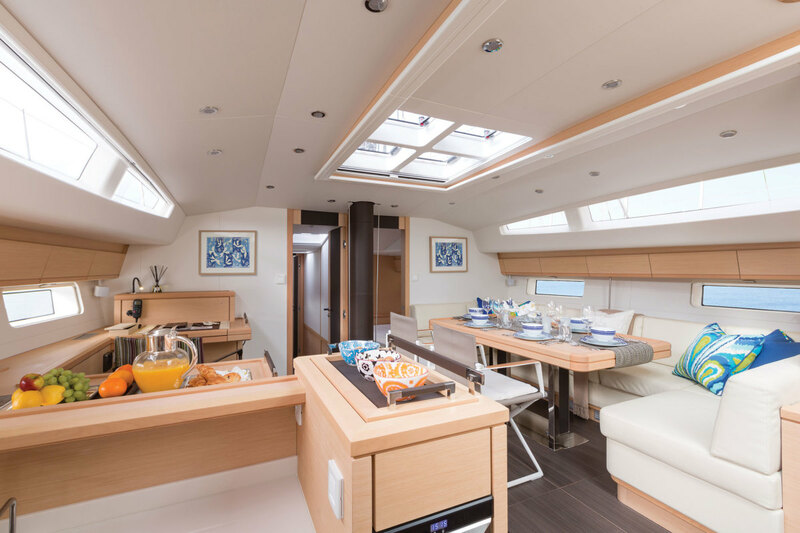 Forward of the galley, opposite the dinette, you can choose between a broad dedicated settee or two different variations incorporating smaller settees coupled with nav stations. To starboard, aft of the dinette, there’s yet another small cabin that can be fitted out with either a pair of single bunk berths or as a proper nav office. Meanwhile, all the way forward in the peak you can have a simple large sail locker or a fully equipped crew’s quarters with twin bunk berths and a toilet. Design-wise, the interior is impeccable. Finish quality is well above average, and Andrew Winch has added several stylish touches—including subtle leather trim throughout and wooden sinks in all the heads—that really set the boat apart. All owners so far have ordered the boat with blonde oak interiors, which creates a light modern feel, but a darker, more traditional teak interior is also available. The boat’s systems installations are well organized, neatly done and clearly labeled. The heart of the craft is a proper full-sized engine and systems space with full headroom behind the companionway. There is also an array of modern amenities. Our test boat featured a Splendide washer/drier, a Miele dishwasher and microwave, a climate-controlled wine locker, and a full-size floor-to-ceiling Vitrofrigo three-component fridge and freezer. 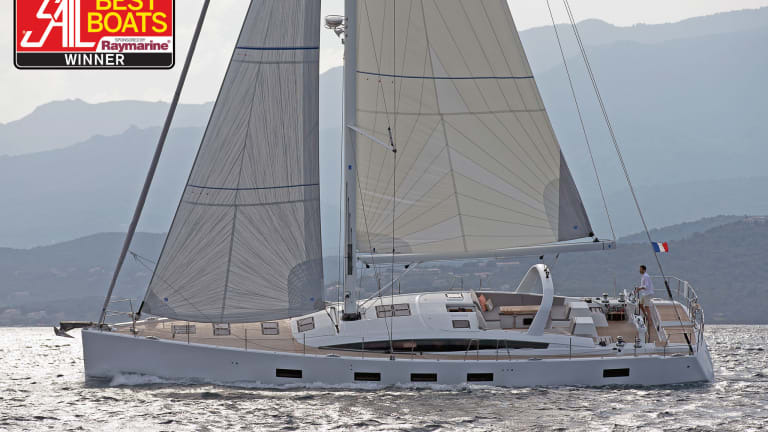 The Jeanneau 64 comes standard with a 9/10ths fractional aluminum Sparcraft rig with a line-controlled in-mast furling system. The mast is supported by three sets of swept-back spreaders and discontinuous Dyform wire standing rigging. A self-tacking blade jib or a staysail set on an optional inner forestay can be sheeted to an athwartship headsail track forward of the mast. An overlapping headsail can be sheeted to proper genoa tracks on the side decks. There’s also an attachment point for an A-sail or Code 0 sail forward of the headstay. All halyards are led to tensioning tracks on the mast and are controlled with removable tails that save the base of the mast from becoming cluttered with great masses of coiled lines. The standard SRPC Spectra/Carbon sails are from North. Our test sail was in light conditions, in a true wind of just 7 to 9 knots, and I was immediately struck by how responsive the boat was for its size and weight. It accelerated and turned quite quickly, hitting speeds over 7 knots on a close or beam reach. Hardening up we exceeded 8 knots in the apparent 13-knot puffs at an apparent-wind angle of about 42 degrees, in spite of the fact we couldn’t trim the main’s fluttering leech line while sailing. Pinching, we made it up to about 38 degrees. Off the wind at a 120-degree angle, we managed a sedate, but respectable 4 to 5 knots without flying any downwind sails. In the coming months, the Jeanneau 64 will reportedly be made available with Harken’s revolutionary Assisted Sail Trim system, a project it completed in collaboration with Jeanneau. In fact, according to Stromberg the boat was configured specifically with this highly automated system in mind. This will make sailing the boat an almost push-button affair. Leaving the dock we immediately noticed that our recently prepared test boat pulled quite hard to starboard going forward under power and just as hard to port backing down. Presumably this had to do with some sort of maladjustment involving the standard four-bladed Flexofold folding propeller. I can only assume this can be easily remedied. We were surprised, for instance, that maximum revolutions on the Volvo D4-180 diesel engine only reached 2,940 rpm, though our speed was good at 10.4 knots. At 1,960 rpm, a very moderate cruise setting, our speed was 8.3 knots. Getting the boat on and off its berth wasn’t too difficult in spite of the anomalous prop walk, thanks to the standard Quick bow thruster and the optional retractable stern thruster. Jeanneau has hit a solid home run here. For a production builder to have created a boat of this quality and size at such a competitive price point is a significant accomplishment. It demands attention from anyone in the market for a luxury cruiser over 60ft in length, regardless of their budget.